Cenotes are Yucatan Peninsula's most unique features! "Cenotes" are cool fresh water sanctuaries scattered throughout the green jungles and savannas of the Yucatan Peninsula. The entrance to magical caverns and cave passages below the earth, cenotes are created when the ceiling of a cave collapses leaving what is sometimes known elsewhere as a sinkhole. Many cenotes have cavern systems which are great for exploring with snorkel or dive equipment. Venturing into a cavern or cave system, or any overhead environment, on SCUBA, is very technical and advanced, requiring specialized training and safety gear. The cavern and caves of the Yucatan are well known and important for underwater cave and cavern explorers who come from all over the world. When visiting a cenote we recommend that you take along your snorkel gear. The water is cool and perfectly clear. If you have a shorty wetsuit, we recommend you bring that too and allow yourself to spend more time exploring the cenote and stay comfortable in the cool sweet fresh water. You will see a mysterious and beautiful underwater landscape and the water is very refreshing. Cenotes are believed to have been of great significance to the Mayan people. Recognized by the Maya as the link between the earth and the netherworlds and often the only source of freshwater in the river-less Yucatan Peninsula, cenotes were considered sacred. Important ceremonial centers were often constructed nearby. Known by the Maya as dzonot (ZO-note), the original name became translated to cenote (say-NOH-tay) by the Spanish. Cenotes are some of the Yucatan Peninsula's most unique features. They are mysterious and beautiful, not to mention a great place to cool off. For this reason, snorkeling through a cenote and cavern is on our list of things not to miss while visiting the Riviera Maya. 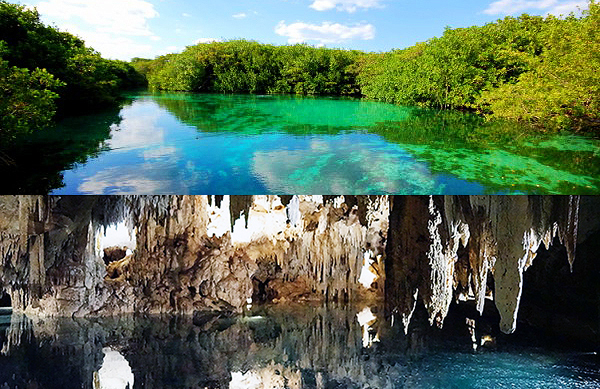 There are cenotes, cavern and cave systems scattered throughout the Yucatan and the Riviera Maya. Amazing halocline where salt and fresh water mix with gorgeous formations of stalagmites and stalactites that will take your breath away!